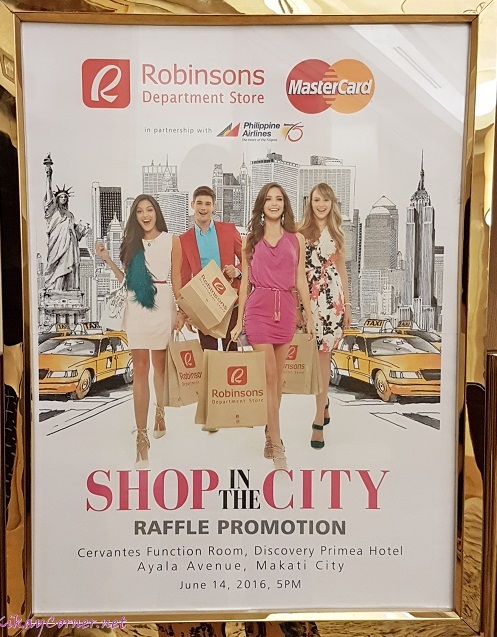 With the “Shop in the City” promo, one lucky shopper can win an all-expense-paid trip for four to NYC, inclusive of roundtrip airfare via Philippine Airlines, a 4D/3N hotel accommodation, and a wardrobe makeover worth P100,000, courtesy of a celebrity fashion stylist. While 10 lucky winners will receive P50,000 worth of shopping spree at Robinsons Department Store. You earn one (1) raffle entry for every P3,000 single-receipt purchase at any participating Robinsons Department Store nationwide using MasterCard’s credit, debit or prepaid cards, whether for straight or installment transaction for credit card use. PNB Mabuhay Miles MasterCard credit cardholders will get 2x the raffle coupon entries while Robinsons Rewards Card Members get 1 additional raffle coupon entry with every purchase. 1. The Promotion period is from July 1 to September 30, 2016. 2. The Promotion is open to all cardholders of Philippine-issued Credit, Debit or Prepaid MasterCard issued by any Designated Philippine Banks. 4. Present your proof of purchase to the Customer Service / Business Center Counter clerk at the Robinsons Department Store branch where purchase was made to claim the raffle coupon/s. 5. All receipts will be stamped CLAIMED upon issuance of coupons. The customer must fill out the raffle coupon with his/her complete name, address, landline or mobile number, email address, bank name (card used) and signature. 6. Drop entries at the designated drop box on or before end of store hours on September 30, 2016. 7. Winners can win only once. The prize of higher value is awarded to the customer should his/her name be drawn more than once. 8. The raffle draw will be held at Robinsons Inc. Head Office located at 110 E. Rodriguez Jr. Avenue, Libis, Quezon City two (2) weeks after the end of the Promo Period, that is on October 14, 2016 at 4:00pm. 9. The raffle draw will be witnessed by representatives from the Department of Trade and Industry (DTI), Robinsons Department Store Representative and MasterCard Philippines. 10. Robinsons Inc. and MasterCard Philippines reserve the right, in concurrence with DTI, to reject a participant if he/she is unable to satisfy the conditions set out in this promo mechanics. 11. Raffle prizes are transferable but cannot be exchanged for nor redeemed as cash or other items. 12. Prizes are transferable provided that the winner must provide a written endorsement letter together with a photocopy of their passport or a valid ID with specimen signature submitted to Robinsons Department Store. The nominated recipient must be able to satisfy the requirements for the claiming of prize. 13. The winner will be printed in an advertisement to be published within (1) one month after the determination of winner in a major Philippine broadsheet and will also be notified by phone and an official notification letter sent by registered mail, based on the cardholder’s information in the records of the respective issuing MasterCard Customer bank. Winner must sign the (1) Release, Waiver and Quit Claim Form and (2) submit the original official notification letter, (3) present their winning eligible MasterCard branded consumer credit, debit or prepaid card, (4) present the original statement of account (SOA) or the original charge slip, and (5) One (1) present valid government issued ID. The “Shop in the City” raffle promo will run from July 1 to September 30, with the winners to be drawn on October 14, 2016. Mastercard cardholders get a chance to shop their way to the Big Apple getaway! Check out www.robinsonsdepartmentstore.com.ph. Follow Robinsons Department Store on Facebook and Twitter @RobinsonsStore for updates and promos.